This program does not include a book signing. All books will include a signed bookplate from the author. 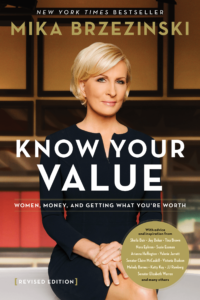 In Know Your Value: Women, Money, and Getting What You’re Worth, Mika Brzezinski helps women find their voices, effectively communicate their value, and get more respect for their contributions in the workplace and beyond in this revised and expanded edition of Knowing Your Value, her 2011 bestselling book about women and negotiating. Know Your Value features updated statistics, fresh interviews, and new material about knowing and getting your full value at work, at home, and in life. Prompted by her own experience as co-host of “Morning Joe,” Brzezinski interviews a wide range of women on their experiences moving up in their fields, including Valerie Jarrett, Sheryl Sandberg, and Senator Elizabeth Warren. She also gets honest answers from Joe Scarborough, Donny Deutsch, Jack Welch, and other thought leaders about why women are paid less and what pitfalls women face—and play into. Know Your Value blends personal stories with the latest cutting-edge research on women and salary negotiation, why the gender wage gap persists, and what can be done about it. Brzezinski also discusses changes in her personal life that have given her insight on her own worth, gender bias in the age of Trump, and how #TimesUp and #MeToo have changed office politics. Brzezinski is the founder of the Know Your Value movement and the author of All Things at Once and Obsessed. She also serves as a visiting fellow at the Harvard Institute of Politics. In conversation with Katty Kay, the Washington, DC anchor for BBC World News.